Teach Yourself Instant French is the French version of a best selling range of teach yourself book and CD courses. The series has proved incredibly popular and has helped thousands of people around the world learn their language of choice. The French version is no different and the course has been designed and structured by Elisabeth Smith – one of the UK's leading language authors – to ensure it's up to scratch. Teach Yourself Instant French is a book and CD course that should be available from most book stores. Check out the links on this page for the best price we could find though. For the price you get an excellent beginners introduction to the French language, which covers reading, writing and listening equally well. In terms of value for money it isn't the cheapest course around as it only serves as an introduction to the language. Don't get us wrong – you will learn a lot, but just don't expect to be speaking like a native by the end of it! The quality of both the book and CD parts of the course is excellent. Clearly a lot of work has gone into designing a book that looks good, is easy to follow and contains lots of useful things you need to know. The no-nonsense approach to learning that Elisabeth Smith takes is very refreshing and cuts out a lot of the non-essential stuff that other courses can bog you down with. You will have to go back and fill in the gaps if you intend on progressing your French though! The idea is to spend 35 minutes a day for six weeks to complete the course and by that point you should be comfortable in a lot of common situations on your travels. The one criticism that some people have with Teach Yourself Instant French is that the stripped down approach to learning cuts out a lot of important things. For example, by the end of this course you are only expected to know around 400 words, which is fine as an introduction, but you will probably want to purchase some other learning materials to expand your vocabulary pretty soon afterwards. However, we can't deny it does introduce you to the language quickly and effectively. 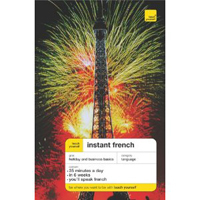 Teach Yourself Instant French is one of the best looking teach yourself French books we have seen, however it does skimp over a few things we thought should have been gone into in more depth. It is slightly more expensive than similar products, but you are paying for top quality design with Teach Yourself Instant French. We recommend checking out other similar products out there, such as in our top ten, but you won't go far wrong with this beginners course.